Augmented reality is on the cusp of radically transforming not only our daily lives but also education, making almost every experience in the real world a potential learning opportunity. We already rely on maps that suggest nearby restaurants and voice-activated technologies, and undoubtedly our dependence on instant and relevant information to real world experiences will continue to grow. As augmented reality technologies become ubiquitous and inexpensive (or even free), they provide a powerful tool that can be leveraged to engage students both in learning and creating content. During the fall of 2015, undergraduate history students at the University of Central Missouri were among the first in the country to participate in a student-driven, course-based project that leveraged cutting-edge augmented reality technology to create museum displays. As part of Dr. Jessica Cannon’s HIST 4328 History of Flight course, students researched and produced historical documentary materials on local and nationally important moments in aviation history. Those materials were then converted to augmented reality displays for the Nicholas Beazley Aviation Museum in Marshall, Missouri. Only a few museums (like the Smithsonian) have used professional staff to create their own augmented reality content to date, but this course project was unique in that the content was student-produced using the Aurasma app (www.aurasma.com). For the project, students spent the semester researching, writing, and producing mini documentaries on both historical topics and biographies that complemented the existing displays in the museum. This part of the project was much like a traditional research paper, with students expected to utilize primary source documents and provide proper citations for their work. The information they found was then organized into short scripts that were paired with images to create short historical documentaries. 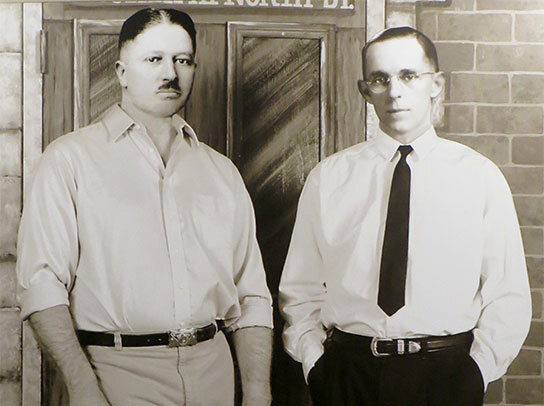 In one case, students took on the characters of the two founders of the company, Russell Nicholas and Howard Beazley, to record an introduction for the museum. To supplement the historical context of this blended online and face-to-face course, assigned readings provided the basis for discussions on museum display design, video production, and documentary strategies while students worked outside of class on researching and developing their videos. Students worked in teams of four or five and ultimately created a total of six augmented reality “auras” using the Aurasma app. Each aura runs 2-3 minutes when viewed in the museum, so students had to learn to be concise and selective in providing essential details and context for their topic without losing their audience (who would be holding their phone or tablet aimed at the target image for that time). A seventh “aura” was filmed at the museum and is a longer video demonstration by museum staff of how a wooden propeller is made. The Nicholas Beazley Company facilitated the development of the Marshall Flying School, which by 1929 was the largest commercial flight school in the world. This image will launch the aura that was created as part of this project. If you are unable to access the content through Aurasma, you can also view the video at the following link: https://youtu.be/Pu6vW3-tok4. 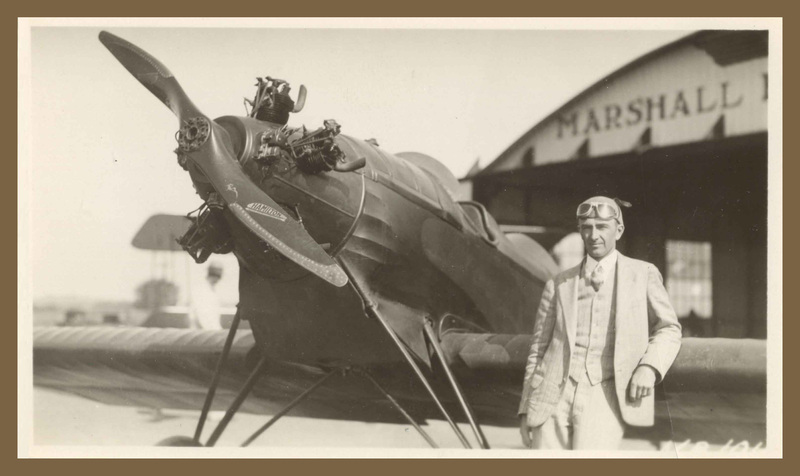 This image launches an interview between Dr. Jessica Cannon and student Michael Gawlick discussing student experiences in the History of Flight Aurasma Class Project. The video for this aura is also available at https://youtu.be/Hw0As7w_Jdg if you are unable to access the content through Aurasma. The project grew out of a general demonstration of augmented reality using the Aurasma app, and the realization that this sort of technology is ideal for creating inexpensive but highly interactive displays for museums. But, it can be applied in other disciplines too, with the potential to impact students in any field of study. Students can use it to modify existing research projects or create safety procedure demonstrations for labs. They can also utilize augmented reality apps to create interactive photo essays for study abroad trips, or create advertising posters for theater productions or other events that come to life with a short video of the event. And, faculty can use it to provide supplemental instruction within a textbook for on-demand assistance in online or hybrid courses. Images in the text can launch additional explanations provided by the instruction at problem areas or concepts in a chapter, answering common questions students have at the moment they need help. Terry McNeeley, Instructional Designer at the University of Central Missouri, created both the chart tool and this downloadable PDF version. 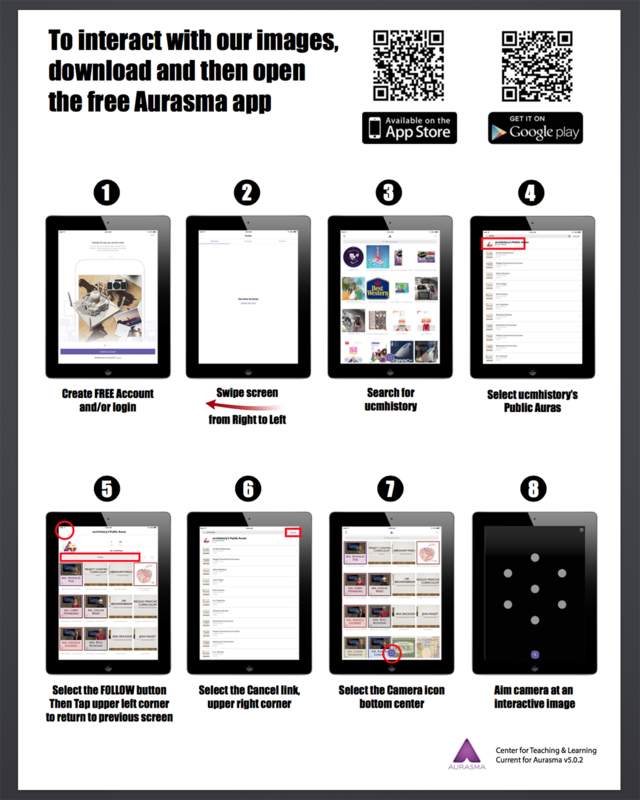 There are several apps that can be downloaded to tablets or smart phones, including Layar and Augment, although the Aurasma app (www.aurasma.com) was used for this particular project. It works through the camera on a device, which sees a target image and pulls the related content from the Aurasma server that was uploaded by the user. As an example, several images in this article will launch additional augmented reality content. It will work from printed pages or from your computer screen, and you can see that content by downloading the Aurasma app in Apple’s app store or through Google Play. Once you download the app, you will need to create a free account and then search for and follow the account “ucmhistory” to view the content. 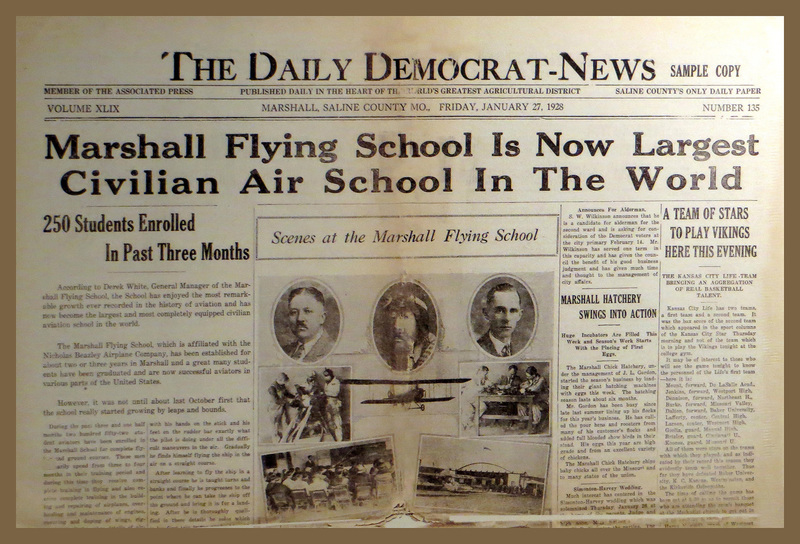 The image of Nicholas and Beazley, as well as the image of Barney Zimmerley and the Marshall Flight School newspaper, will launch content created as part of this history project. The image of Dr. Cannon and student Michael Gawlick will launch a short interview discussing the student experience with the project. Additional examples of auras created for the project, as well as an overview video and additional information, are available at http://drjessicacannon.com/aurasma/. Jessica A. Cannon is an Associate Professor of History at the University of Central Missouri, where she has taught for six years. 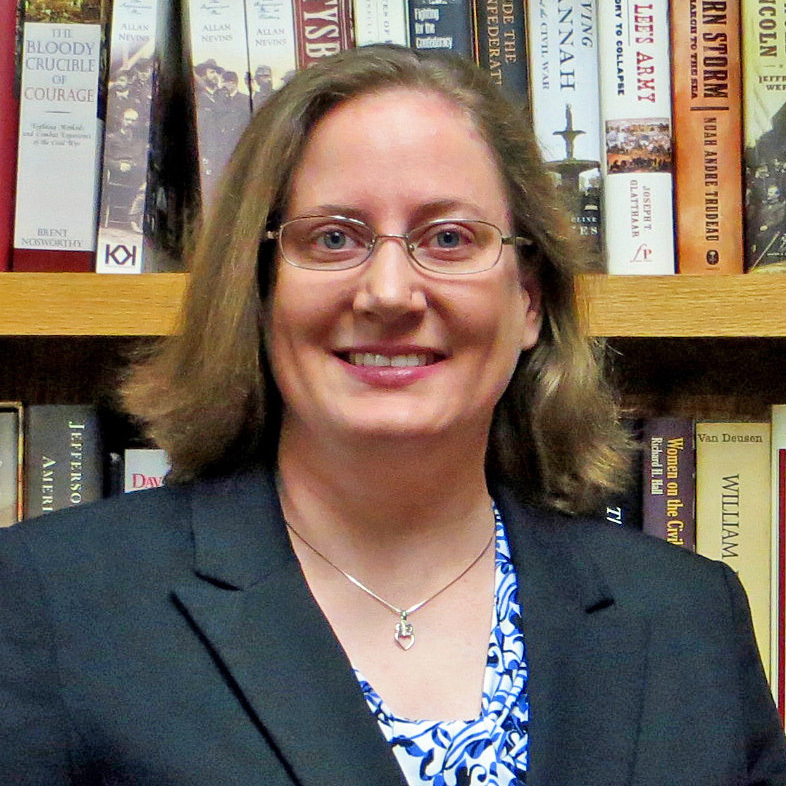 She completed her Ph.D. in American History at Rice University, and teaches and researches nineteenth-century U.S. history with an emphasis on social, cultural, and military history. She also has worked as a researcher and intern in the History Office at NASA’s Johnson Space Center in Houston, an experience that deepened her interest in the history of manned flight and technology. She is currently working on a Graduate Certificate in Instructional Design through the Educational Technology and Leadership Program at George Washington University, and serves on several distance education and technology committees at UCM. 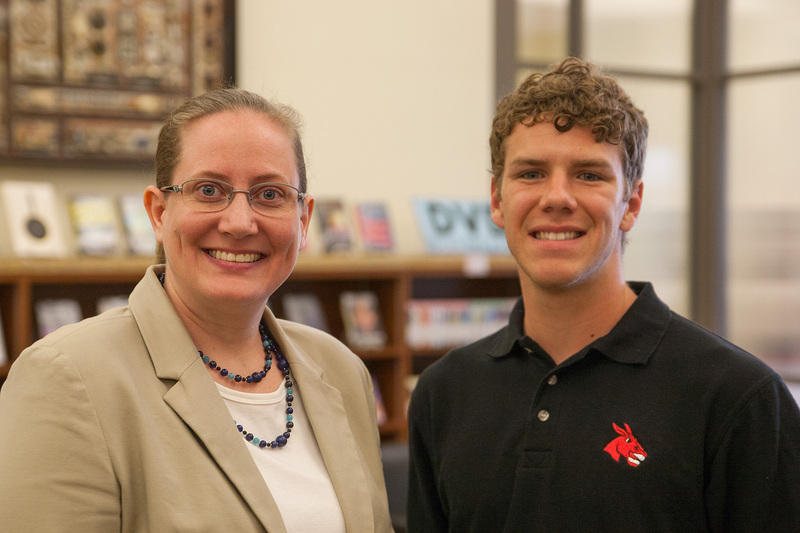 Dr. Cannon can be reached by email at jacannon@ucmo.edu. Discussion of "Augmented Reality Course Projects Make History Come Alive"
Version 41 id 782996 of this page, updated 09 June 2016 by Colleague 2 Colleague. Created by Shalin Hai-Jew.